For other uses, see Michael Clayton (disambiguation). Clayton signing autographs in 2006. Michael Rashard Clayton (born October 13, 1982) is a former American football wide receiver who played professionally in the National Football League (NFL). He was drafted by the Tampa Bay Buccaneers 15th overall in the 2004 NFL draft. He played college football at LSU. Clayton prepped at Christian Life Academy in Baton Rouge where he was one of the most sought after recruits in the nation his senior year. He played in the first ever U.S. Army All-American Bowl on December 30, 2000 alongside fellow LSU teammates Ben Wilkerson, Andrew Whitworth, and Marcus Spears. Michael also played basketball there. In 2008 he became the first inductee in the Christian Life Academy Hall of Fame. Clayton played college football at LSU where he was part of the NCAA champion LSU Tigers. During his three years with LSU, he caught 182 passes for 2,582 yards and 21 TDs for the Tigers, and ended his LSU career with the record for career TD receptions with 21. The record was later broken by Dwayne Bowe in a game against Tennessee on November 4, 2006. He finished second in school history in receptions with 182, just one shy of tying Wendell Davis's record of 183. He is ranked fourth in career receiving yards with 2,582 and seventh in career 100-yard games, and is the only player in LSU history to have at least 700 yards receiving in three straight seasons. Clayton is a member of Alpha Phi Alpha fraternity. Clayton was initiated into the Nu Psi Chapter of Alpha Phi Alpha in the Spring of 2003. Clayton was drafted by the Tampa Bay Buccaneers with the 15th selection of the 1st round of the 2004 NFL Draft. After a promising 2004 rookie campaign with Tampa Bay, where he led all NFL rookies and the Buccaneers with 80 receptions for 1193 yards, and his team with 7 touchdowns, Clayton had a relatively disappointing season in 2005. With knee surgery in the offseason and a season riddled with small mistakes on the field, he finished up with just 32 receptions for a total of 372 yards and no touchdowns. He was forced to sit out the final game of the regular season against the New Orleans Saints with a turf toe injury, and also sat out the Buccaneers playoff match up against the Washington Redskins. His second season was very disappointing and inconsistent. The start to the 2006 season showed that Clayton had returned to his healthy past of 2004. Clayton looked good with 3 receptions and 34 yards despite the Buccaneers offensive struggles on September 10 in a 27–0 loss to the Baltimore Ravens. Continuing his return to his 2004 form, he caught 6 passes for 55 yards and a touchdown against the Cincinnati Bengals on October 15, 2006. His touchdown, thrown by Bruce Gradkowski, came with seconds left and gave the Tampa Bay Buccaneers the go ahead lead for their first win of the 2006 season. Unfortunately, following an undisclosed injury, the Buccaneers placed him on injured reserve, ending his season with four games remaining. He followed that overall performance with a forgettable 2007 season, although he did come on strong down the stretch. He made the most of his opportunities at the end, when the Buccaneers were resting many of their starters (which many analysts considered a mistake). He caught 22 passes during his 14-game season, 16 of those came in the last four contests and 10 coming in the last two. He also amassed 192 of his 301 yards in those four games. Clayton got to play in his first post-season contest on January 6, 2008 against the eventual Super Bowl-champion New York Giants. He caught 3 passes for 39 yards. After the 2008 season Clayton became a free agent, but re-signed with the Buccaneers to a new five-year deal. After signing the deal he made the famous "check is in the bank" quote. 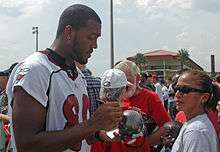 The Bucs released Clayton on September 4, 2010. Clayton joined the Omaha Nighthawks of the United Football League on October 25, 2010. On September 23, the Giants re-signed Clayton after placing Domenik Hixon on injured reserve. He became a free agent after the season. Clayton runs the Michael Clayton Generation Next Foundation, which is a non-profit organization aiding local charities around Tampa Bay and Baton Rouge; mainly the Ronald McDonald Care Mobile and the Tampa Bay Pediatric Cancer Center. Clayton holds the annual Michael Clayton Celebrity Hoops Jam, a celebrity basketball game, to raise money for the foundation. Clayton has been a pundit for Sky Sports' NFL coverage in the United Kingdom. Clayton now attends Florida College in Temple Terrace, Florida and is finishing out his degree there. ↑ "NIC Greeks in Professional Football 2007". Greeks in Sports. North-American Interfraternity Conference. Retrieved 2009-03-25. ↑ "Lines of Nu Psi".